Muse are set to debut their brand new song 'Survival' tonight, which will be the official song of the 2012 London Olympic Games. 'Survival' will make its radio premiere tonight and will be available shortly after via iTunes. The song will be featured throughout the sporting events in all of London's 2012 venues, during the duration of the Games. 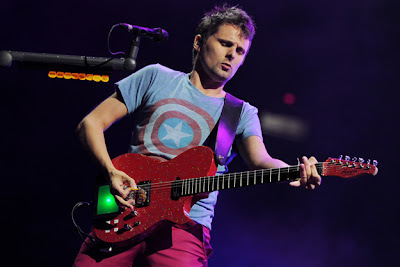 Frontman Matt Bellamy has this to say on the track... "It's a huge honor to have the track chosen as such a major part of the London 2012 Olympic Games. I wrote it with the Games in mind as it expresses a sense of conviction and determination to win." The band have already announced that their sixth studio album, titled "The 2nd Law" will be out later this fall, as a count down to September 17th has been set. Look for 'Survival to make the cut on the new album and preview the track below as you anticipate its arrival later on this evening.